Ford outsold Chevrolet in 1957, but the 1957 Bel Air has been called ‘the most popular used car in history.’ This Bel Air Sport Coupe has the iconic 1957 Chevy color combination of Sierra Gold and Adobe Beige. It is equipped with the popular ‘Power Pack’ option, which added a four-barrel carburetor and dual exhausts to the 283 cubic-inch V8. This car is not equipped with the optional heater, which is rather unusual for a Bel Air. From 1950 through 1952 Chevrolet hardtops in the Deluxe model line were dubbed the ‘Bel Air’. It took a few more years before it would become its own distinct series. In 1953, the Bel Air became its own model and was applied to Chevrolet’s top-of-the-line model range. By 1955, the cars were offered with an optional V8 engine which greatly improved the cars performance. In 1953 Chevrolet had three new models and 17 body styles to select from. This was the company’s widest range of offerings in its history. The introduction of the Chevrolet was stirring press for the company, but so was the Bel Air, considered the company’s Crown Jewel. The Bel Air Series consisted of a two and four-door sedan, sport coupe, and a convertible coupe. Everything that was standard on the lower priced series was standard on the Bel Air, plus so much more including comfort, convenience and styling options. There was a one-piece curved windshield which added superb visibility. The luggage compartment was massive and the 115-inch wheelbase provided plenty of interior room for its occupants. The 115-horsepower Blue-Flame six-cylinder engine was new and the most powerful engine in Chevrolet’s history. In 1954, the Bel Air was launched as a 1955 model and brought with it a fresh new, elegant look for Chevrolet. 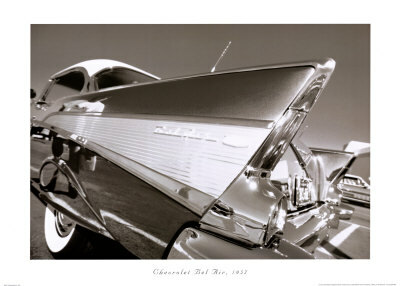 With bold features that included hooded headlights, tailfins, wrap-around windshield, and rear fender skirts, the Bel Air was able to out-style the competition. The base engine was a six-cylinder, 115 horsepower power-plant. At a base price of $1095, it was a bargain. It is considered America’s first low-priced ‘hardtop coupe’. The most famous of the Bel Air engine options was the 283 cubic-inch V-8 small-block, with Ramjet Fuel injection. It delivered one horsepower per cubic inch, a first for production cars. Along with style, the Bel Air was a fast machine. Chevrolet quickly ascertained a reputation for building performance vehicles. A full-width grill, redesigned front and rear fenders, gas cap behind the left taillight, larger rectangular parking lights, and sweeping side trim were just a few of the changes that set the 1956 Chevrolet apart from the 1955, which had taken the country by storm with its all new body re-design. For the performance-minded public, the 1956 Chevrolet offered three 265 cubic-inch Turbo-Fire V-8 engine options: base 170 hp, 205 hp 4 bbl and the 225 hp dual 4 bbl. 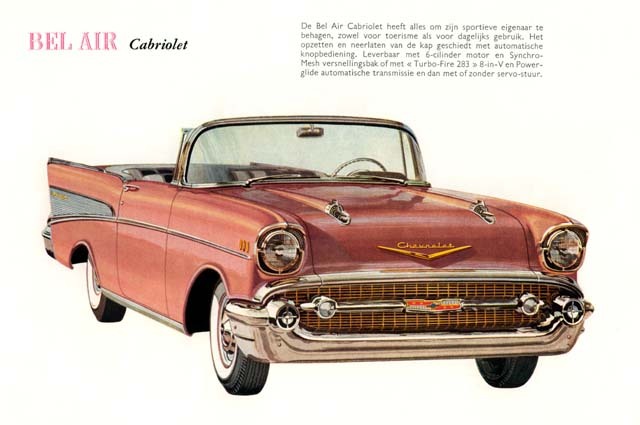 Chevrolet produced 1,574,740 cars in the 1956 model year, of which 41,268 were Belair Convertibles. The 3,320 pound car cost $2,443 with the base V-8. You could literally load your new Chevy with factory options and accessories and stay under $3,000. In 1957, the Bel Air grew in length by 2-1/2 inches and received a wider and taller grille. Additional options became available including two-tone interior, power convertible top, shoulder harnesses, tinted glass, seat belts, tissue dispenser, and ventilated seat pads. In total, there were seven body styles to select from. 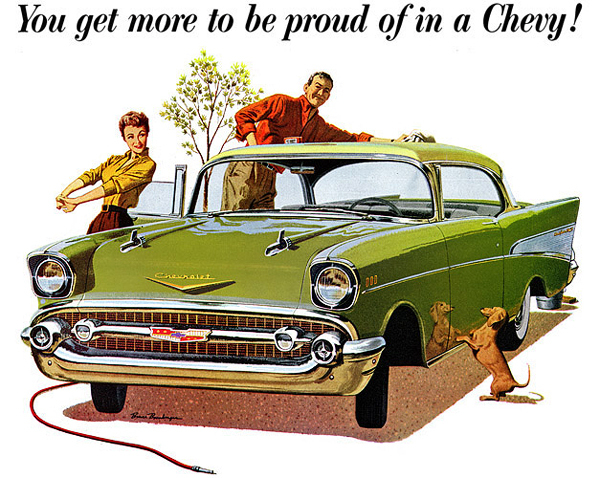 In 1957, a two-page Chevrolet magazine ad proclaimed that ‘Chevy puts the purr in performance’. This Bel Air Convertible, with the optional 245 HP 283 CID small block V-8 equipped with two four barrel carburetors, would certainly deliver on the promise made by the ad copy noted above, delivering a hearty purr from its dual exhausts. Over the years these popular cars became an icon for the entire generation and they have gone on to become one of the most desirable and collectable post war cars of all. 47,000 Bel Air convertibles were produced in the 1957 model year. 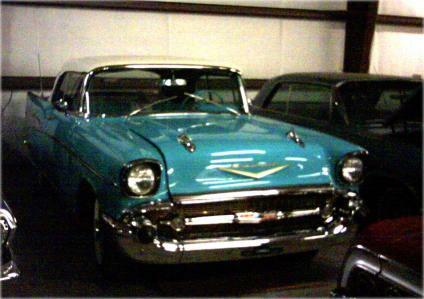 The Chevrolet models grew in length in 1958 and increased in size. The Chevrolet Impala became their top-of-the-line model, followed by the middle-range Bel Air. The front end featured a broad grill with quad headlights. By the later part of the 1960s, the Chevrolet Bel Air moved into the territory of a fleet vehicle. It was a basic machine built on Chevrolet’s large platform and outfitted with few thrills or options. It was a good car though it lacked the prestige of times gone by. The 1964 Chevrolet Be Air (Series 1600) was Chevrolet’s mid-priced line between the basic Biscayne and the Impala. The Biscayne was discontinued after 1972 and the Bel Air was moved into its place, becoming Chevrolet’s low-level model. Production in the United States continued until 1975 though production continued in Canada until 1981. This entry was posted in Advertising, Cars and tagged 57 Chev by blues63. Bookmark the permalink. I love the valuable info you supply in your articles. I will bookmark your weblog and have my children check up right here often. I am quite sure they may be taught lots of new stuff here than anyone else! I love these Post! We have a 1957 Belair 4 door but more of a muscle car. She is sleek and clear. Her Larkspur blue color, lights everyone’s eyes up. People remember when they were young children how much fun these comfortable, sporty, jazzy cars looked. We were teenagers when we got our first one which was dark green and trully loved that car till my husband left for the Army in 1969. That baby was 12 years old but brand new to us. We finally landed a beauty and the wonderful feelings we have again have made such wonderful times occur again. The Chevrolet with the bowtie….what can we say. We will enjoy this beautiful car and keep her in the family. She is in shows and on calendars and she smiles herself to see the excitement from people who love to have their pictures in her and most of all when she appears in the Parades. These cars are the Classics from the 1950’s and will forever be a spark to all ages. Enjoy and learn more everyday!